Sonar Bangla Insurance Limited is a reputed Private Sector Insurance Company. 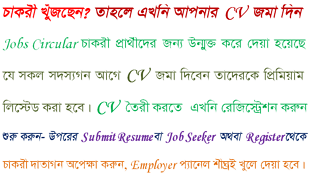 It has invited a job circular for the posts are General Manager (Underwriting & BCD), Deputy General Manager (Accounts & Finance), Deputy Manager (Claims & Re- Insurance), Deputy Manager (Audit), Senior Officer (Audit). Candidates should have minimum experience. Sonar Bangla Insurance invites applications from the Bangladeshi Nations.